SEBRING (AUS) (Chestnut 2005-Stud 2009). 5 wins at 2, STC Golden Slipper S., Gr.1. Sire of 586 rnrs, 371 wnrs, 36 SW, inc. Dissident (ATC Randwick Guineas, Gr.1), Criterion, Egg Tart, Lucky Bubbles, Bring Me the Maid, Gold Standard, Seaburge, She Brings Joy, Catch a Fire, Hattori Hanzo - Let Us Win (H.K. ), Believe Yourself, Ulmann, Thurlow, Art Series, Broadband, Acatour - Great Honour (H.K. ), Turbo Miss, Clifton Red, Supido, Kiss a Rose, etc. Central Station (g. by Manhattan Rain). 7 wins at 1050m, 1350m to 2016-17 in Macau, Macau Sand Champion Series Leg 1 H., Blackpool H., Calgary H., 3d Macau Gulfstream H., Admiralty H.
Doubt Defying (g. by Not a Single Doubt). 3 wins-1 at 2-at 1200m, 1350m to 2017-18, BRC DF Interiors P., Ascot Green P., GCTC Sky Racing 2YO H., 2d BRC Vid Luckus H., 3d BRC Weddings P.
SARTHEMARE (Street Cry). 2 wins. See above. Deportment. 4 wins from 1300m to 1700m, 2d WATC Westspeed Stayers' Bonus H.
Miss Liffey. 8 wins-1 at 2-to 1050m, A$128,595, to 2017-18 in Aust. Nineveh's Wish. 3 wins-1 at 2-from 1100m to 1600m in Aust. Stoddart. 2 wins at 1200m, 1250m to 2017-18 in Aust. Confess and Avoid. Winner at 2000m in 2017-18 in Aust. Rhythmical. 2 wins at 1100m, 1200m in 2017-18 in Aust. Lucky Boy. 2 wins at 1200m to 2017, Singapore TC Class 5 H., 2d Singapore TC Class 4 H., Lim's Objective S., Class 5 H., 3d Singapore TC Class 4 H., Phar Lap S., Class 5 H.
River Reach. 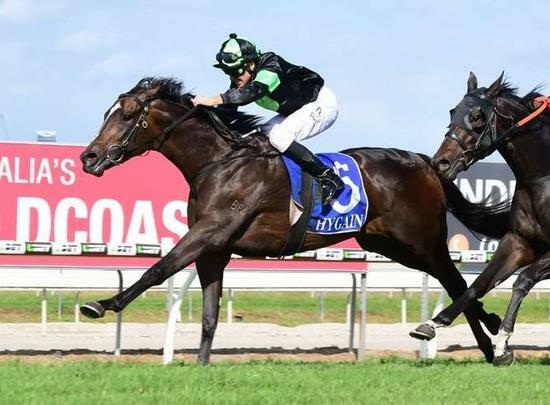 15 wins-1 at 2-to 1400m, A$190,270, BTC Betty Taylor Welter H., QTC Chiquita Brands H., SAJC Irish Heiress H., 2d BTC Health Research Fund H., Quick Fit Tyres H., Doomben Dash H., Qld Tatt's RC Country Cup, QTC Cockatoo Ridge H., XXXX H., Pacific Prince H., Veterans Research H., 3d QTC Function & Catering Welter, BTC Perrier H., Qld Tatt's RC Country Cup, Fosters Special Bitter H., QTC Apprentices' Cup, Jabba Hut H.
Hollywood Lad. 12 wins to 1400m, A$97,135, AJC WC Wentworth H., STC Engadine Hotel H., Emu Plains H., 2d STC Truscotts Toyota H., 3d AJC Bill Kelso 2YO H.
Serious Money. 7 wins to 1400m, A$149,830, AJC Equal Welter H., Drake Executive H., Shame H., Challenge Stakes in April H., Blue Legend H., 2d AJC Hayson H.
Bold Vantage (Bold Bidder). 6 wins, 3d Ak-Sar-Ben King's S., L.
Magic Pepper (Magesterial). 3 wins, 2d Monmouth Continental Mile S., L.
SONGSTER (Songandaprayer). 4 wins at 6f, 7f, US$377,028, Belmont Woody Stephens S., Gr.2, Bold Ruler H., Gr.3, Pimlico Hirsch Jacobs S., Gr.3, 2d Saratoga Amsterdam S., Gr.2, Aqueduct Bay Shore S., Gr.3, 4th Belmont Spooky Mulder S., L.
MOPOTISM (Uncle Mo). 3 wins-1 at 2-at 1m, US$561,200, to 2018, Santa Anita La Canada S., Gr.2, Sunland Park Island Fashion S., 2d Santa Anita Summertime Oaks, Gr.2, Las Virgenes S., Gr.2, Indiana Oaks, Gr.3, 3d Los Alamitos RC Starlet S., Gr.1, Santa Anita La Brea S., Gr.1, 4th Santa Anita Oaks, Gr.1, Parx Racing Cotillion S., Gr.1.